A simple addon to track the cooldown on the Event Tickets so you can get the maximum of them each event. To earn Event Tickets during the event, complete the zone’s Daily Quests (located within the Brass Fortress). You will receive two Event Tickets from the first Daily Quest you complete each day in addition to the other regular rewards. Note that the Event Tickets are tied to the Daily Quest timer, meaning they’ll reset at 1:00AM EST. You receive a ticket when the cooldown is at 0 and you open a skull plunder (in the case of witch festival event). On this event the tickets have a 20 hours cooldown since you got the last one. ATENTION: The Event Ticket on the ongoing event (witch festival 2018) are only obtained when you receive a golden plunder skull and the ticket is out of cooldown. For the addon to start working, you have to receive an Event Ticket, only then it will start the cooldown. If your game happen to crash or you force close it for some reason, it will not save the addon info and it will lose the cooldown until you receive the next ticket. To prevent this, you can logout or reload ui (using /reloadui command) after you received a ticket. The addon information is saved automatically when you perform a logout or a reloadui. /et - Hides/Reveals the window of the addon. + Updated to the clockwork city event. + Tuned the refresh timers time to avoid inconsistent update times. 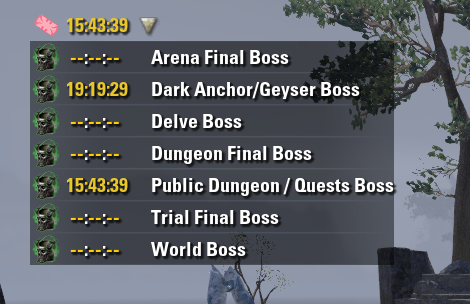 + Fixed one issue where the timers were not ticking down. + Attempt to fix a bug with the HUD fragments, thanks to Kyoma for the fix. + Make the window hide with the HUD. + Added Golden Plunder Skulls cooldown tracker (witch festival 2018). Is an update possible for the undaunted event? Last edited by Marazota : 11/21/18 at 08:11 PM. is this addon server aware? Last edited by ZoLatKam : 11/18/18 at 09:51 AM. Can you add multi-language support please? I like to have my game the more localized possible (in french in my case). For the moment I tweaked the EventTickets.lua file by myself, replacing the "Available" occurences by "Disponible" (FR localization). Came to report the same thing. Any plans to update this addon for the Clockwork City Event? I just got my first 2 Event Tickets for completing my first daily, and the Ticket Timer still says "Available". Yes I will, hopefully tomorrow it's done. Edit: It is done! I am sorry for any bugs you might find, feel free to report here. I am in the middle of a big project deadline and didn't have much time to properly test it. Last edited by kafeijao : 11/15/18 at 09:28 PM. Is it possible to separate the servers because i sometimes play on both so the timer tells me the wrong colldown. Last edited by kafeijao : 10/28/18 at 10:42 AM. Addon MUST change Available to smthing like "Unknown"
This feature would be tricky to implement because when a purple skull is received I would have to understand from which type of source it was obtained (delve boss, world boss, etc...). I don't know a way to do that doesn't involve adding all the monster info and map it to the type manually. Last edited by kafeijao : 10/28/18 at 05:10 AM.